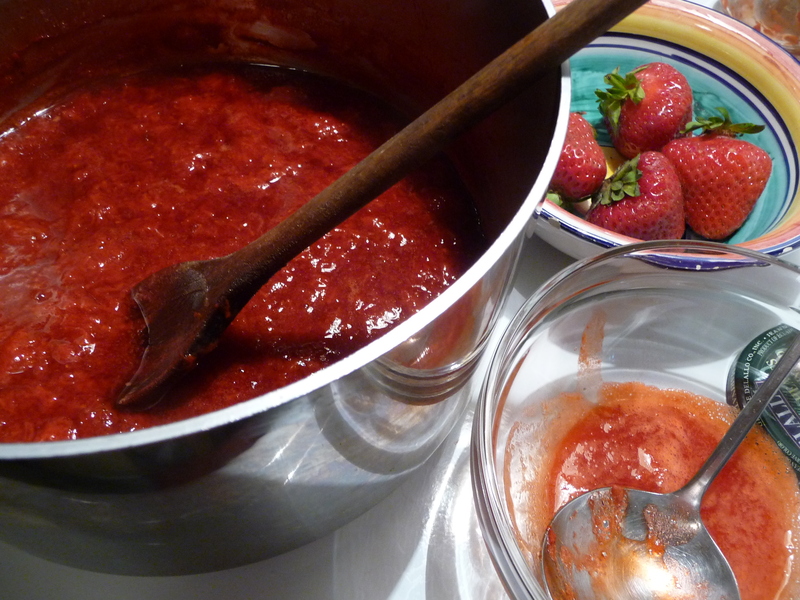 I picked some strawberries yesterday, and after eating some fresh and some atop ice cream, as well as admiring them in my vintage enamel bowl (on my strawberry tablecloth), I decided to make a couple jars of strawberry jam. I like a nice sloppy jam that is in-between sauce and a thicker spread. And, although I love the idea of all those colorful jars of preserves in the cupboard, I don’t like to use the large amount sugar required for the classic version, so I’m resigned to keeping my jam in the fridge or freezer. For a refrigerated jam, you can just cook down fruit and a smaller amount of sugar (as in my earlier post about fresh jam) or you can use commercial pectin designed for a low-sugar jam, which doesn’t require much (or any) cooking. 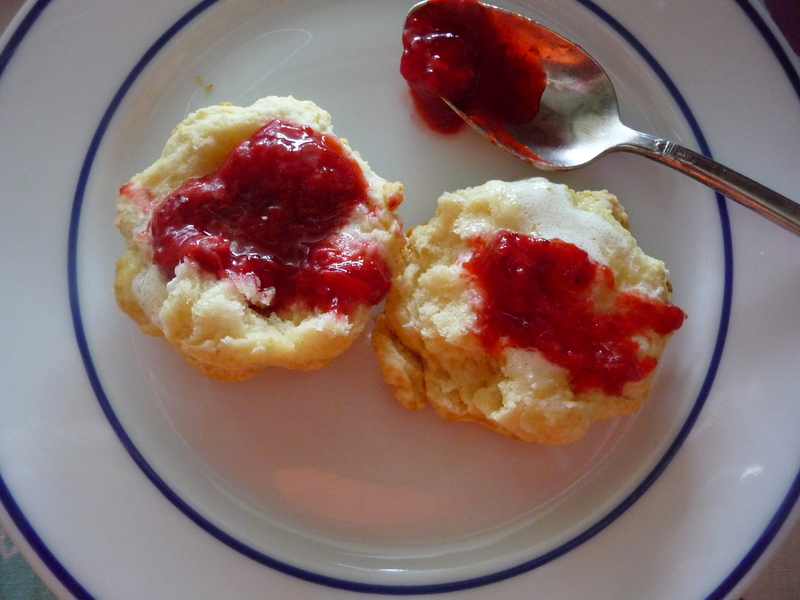 Whichever way you make jam, it is awfully good with hot biscuits or buttered toast. 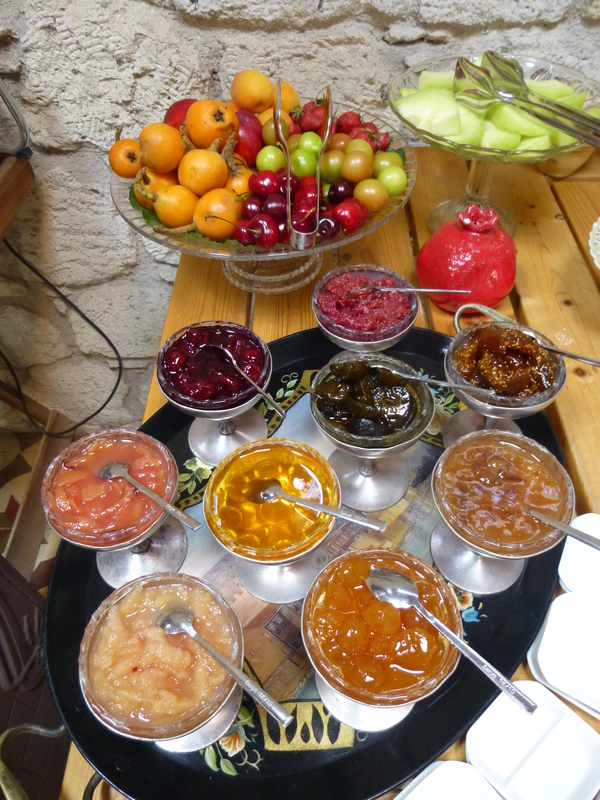 Recently I was in Alaçati, Turkey (near the Aegean Coast), at a lovely little hotel called Incierliev, which offered a great variety of delicious jams and marmalades with the breakfast. 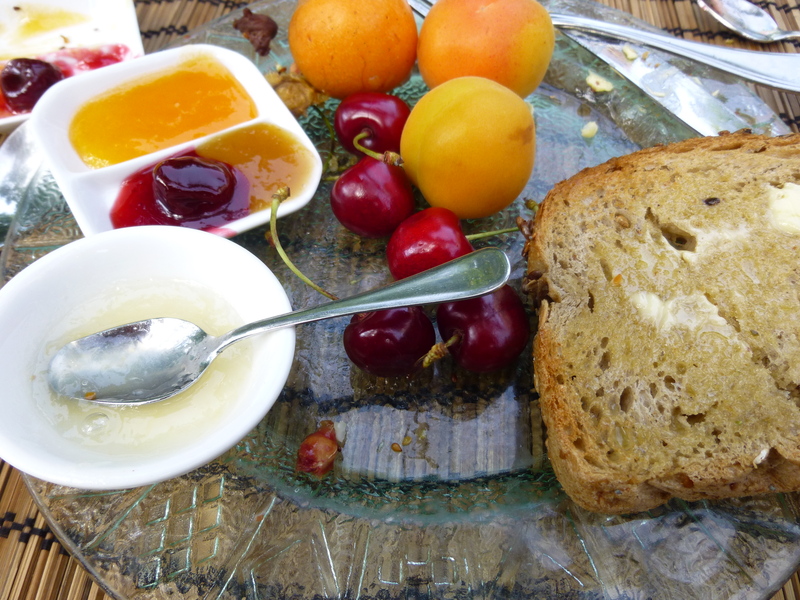 They were less sweet than the standard jams — with that looser texture and intriguing balance of sweet-and-tart that I love. 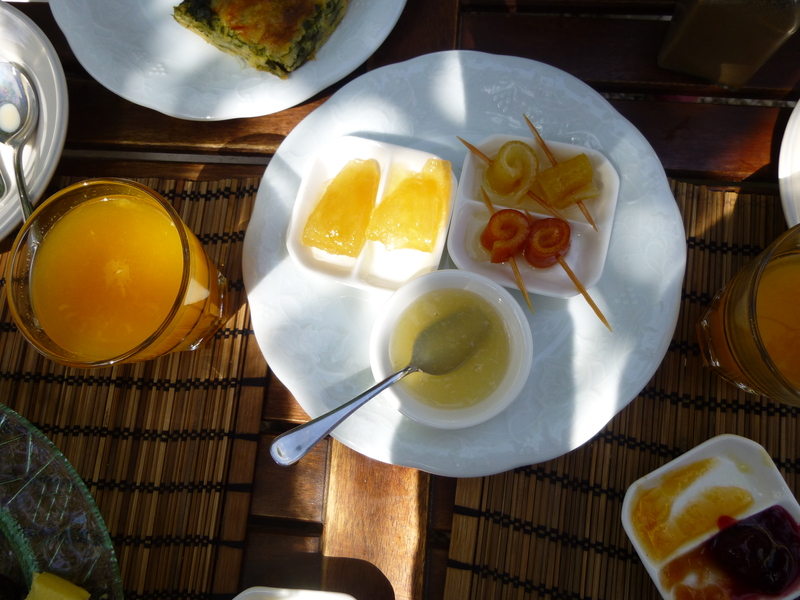 Sabahat and Osman Poshor, the hotel owners, knew that I love lemons, so they gave me a special sampler with candied lemon and orange peels, and three versions of lemon marmalade (with and without peel and pith). Osman is the marmalade master extraordinaire. He made 36 kinds of jams last year and Sabahat says he is always experimenting. And the jams are sun-cooked — or at least partially so. He cooks the fruit and sugar a little on the stovetop first, then puts the mixture in a Pyrex casserole dish and sets it out in the sun for two or three days to finish cooking — bringing the dish inside at night. Here in Western Washington, we really don’t get enough sun to make sun-cooked anything, though I think it’s such an appealing concept. Osman’s jams, like my own, don’t have enough sugar to act as a preservative, so they can’t be stored on a shelf in the cupboard. Instead, they’re kept in the refrigerator. 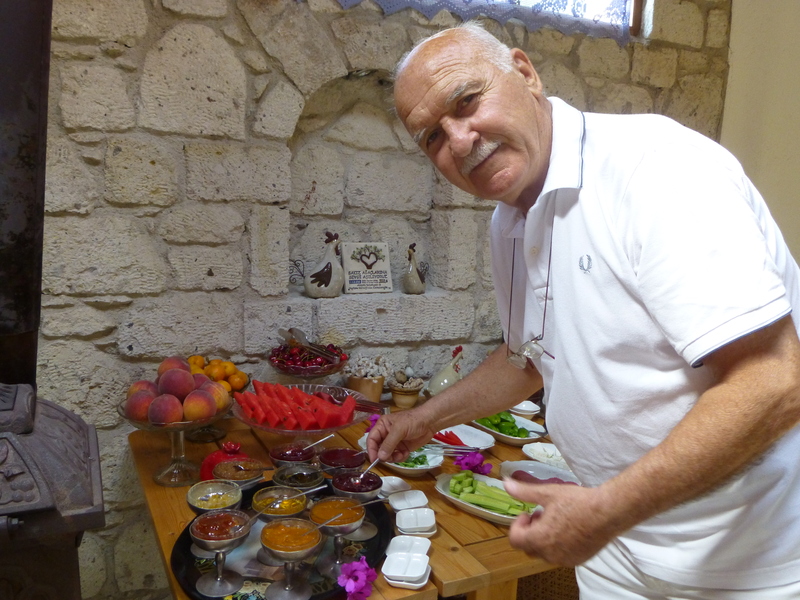 Well, any way you make or come by jam (and Osman reminded me of all the wonderful possibilities — sour cherry, apricot, peach, plum, lemon… not to mention fig and mulberries and quince), every season is right for eating it! 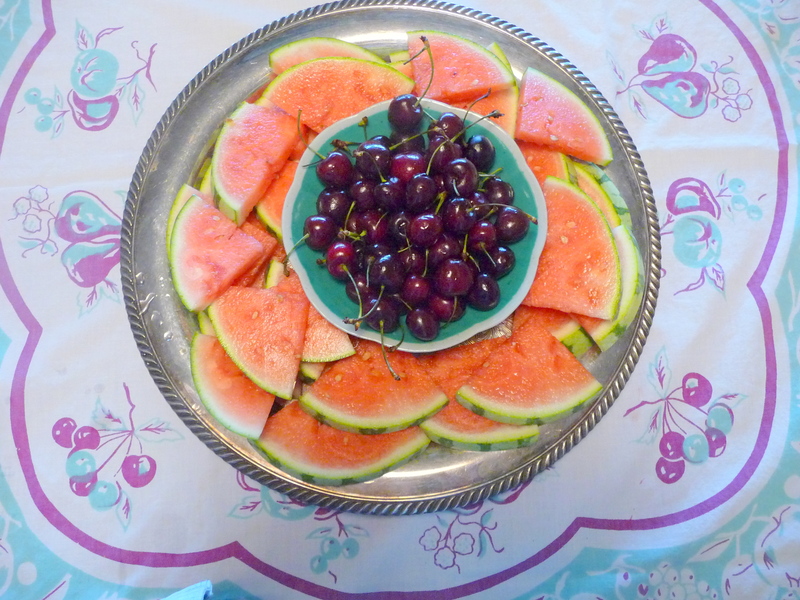 I’m in love with fruit, and summer is a great celebration of it. 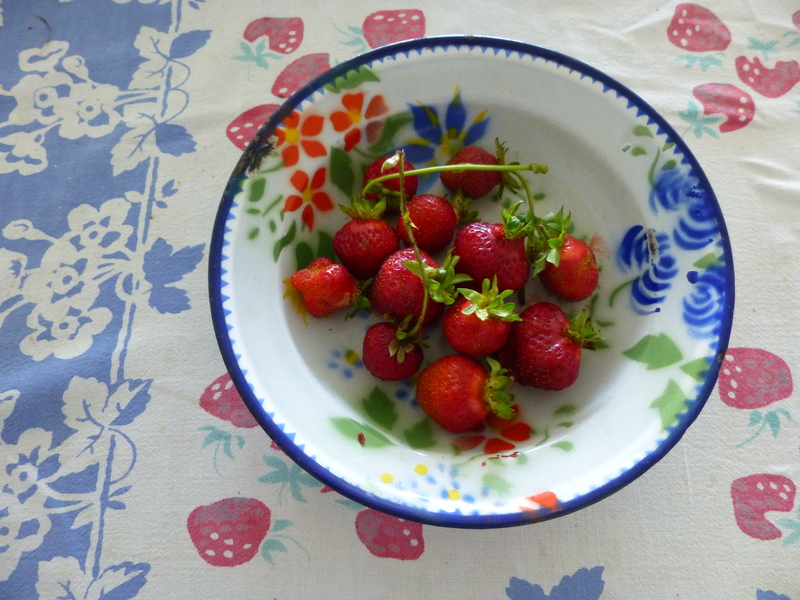 The other day I went to a you-pick farm “out in the county” and picked eight pounds of strawberries in hardly any time at all, while Steve took a nap in the car. We ate a lot of fresh strawberries over the next few days, and gave some to friends and put them in our yogurt and granola and in our salads too. But I still had plenty left over to make a small batch of fresh summer jam. Anybody who’s made jam knows that it takes an appalling amount of sugar. Even the low-sugar jams require a significant amount, needed to preserve them. But if you plan to eat it right up, you can make a nice loose summer jam — between a sauce and a jam — with just a little bit of sugar. I was inspired by Nigel Slater’s marvelous book, Ripe: A Cook in the Orchard. 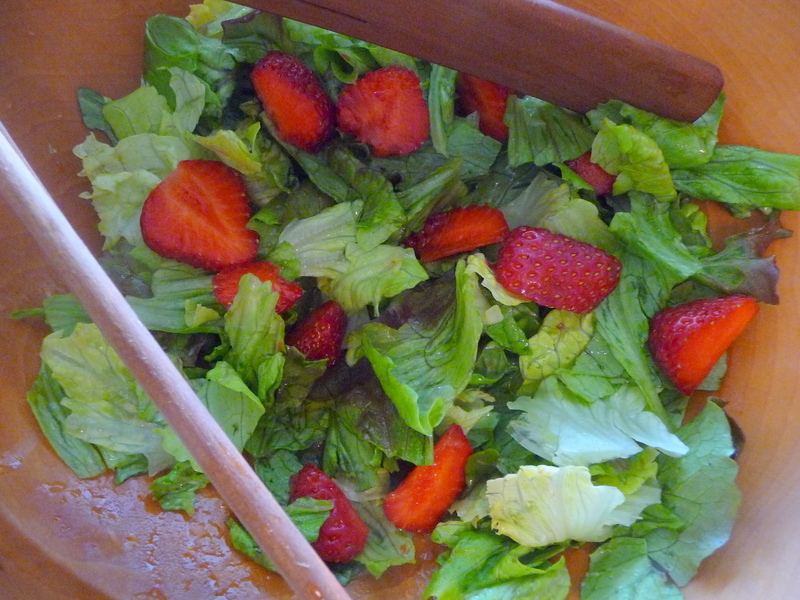 So, I crushed about a pound-and-a-half of strawberries in a good size pot, added a quarter-cup of sugar (you can add more to your taste — Slater uses 1/2 cup) and a couple squeezes of fresh lemon juice. I cooked it over medium heat for 15 or 20 minutes, stirring occasionally and skimming off the pink foamy stuff. When it thickened up (it doesn’t really set like regular jam) it was ready. It kept well in the fridge for a few days, but I liked bringing it to room temperature or even warming it up to serve. I swirled this crimson strawberry jam into vanilla yogurt for dessert (it would be lovely with whipped cream or ice cream as well) and served it on buttered toasted baguette to our friends. I put a little jar of it in the freezer to see if I could thaw out a taste of summer sometime in November. Now there was just enough jam left for breakfast this morning. 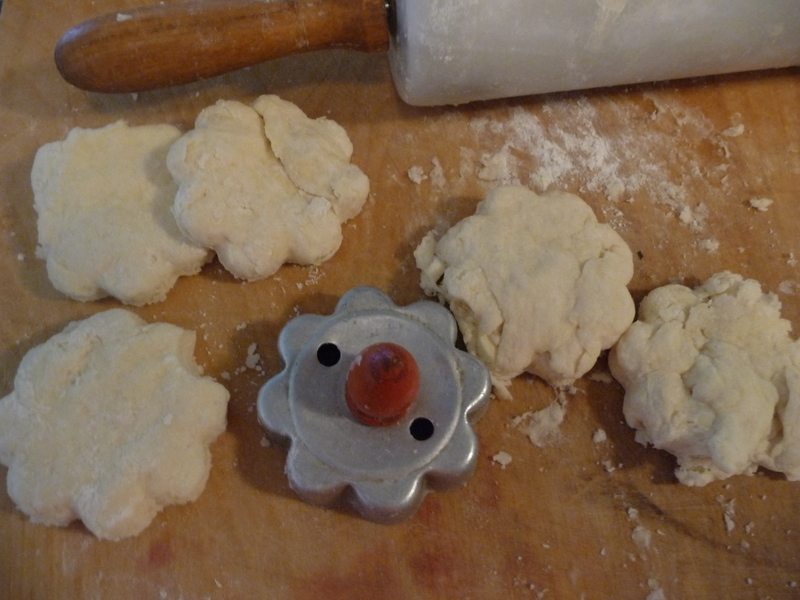 That jam seemed to call on me to make a batch of biscuits. 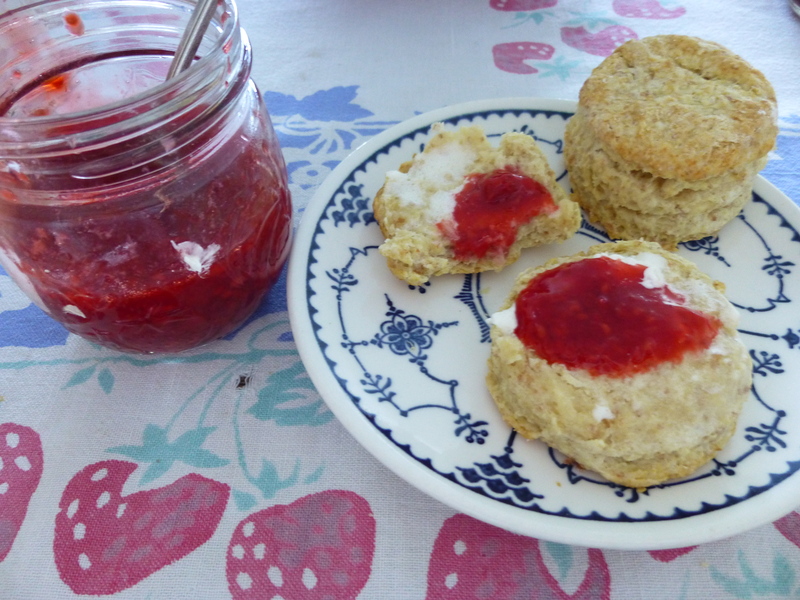 A Sunday morning in summer, with biscuits and fresh strawberry jam. Yum.